Dinner at Christina's: Pepperocini Beef Roast + House Progress! Swistle has been blogging, tweeting, and shouting from the rooftops lately about how good this beef recipe is. Apparently it's been making its way through the blog world like wildfire. Which is news to me, because I never saw it until last week, despite being an avid reader of A Year of Slow Cooking and even own the cookbook! So I picked up the two ingredients necessary. Yes, two. 2. Put the beef in the slow cooker and dump the whole bottle of pepperocinis on top (liquid and all). Cook on low for 8 hrs. or high for 3-4 hrs. (The beef can even be frozen.) Shred the meat with two forks and serve on your choice of bread, topped with cheese and condiments if you wish. It was really, really good. The meat was tender and was reminiscent of a pulled pork BBQ with the prominent vinegar taste. It had a really nice kick to it from the pepperocini. I'm not usually a spicy person, but this was a tasty spicy, so it was great! 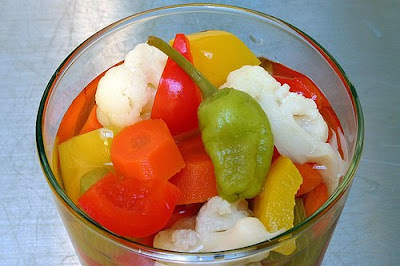 In the future I think I'd like to try it with hot giardiniera pickled vegetables. That way there's a nice spicy variety in there to chomp down on, not just the pepperocini. For those of you keeping track of the house update - there's been a ton of progress made! Downstairs has been taped, spackled, sanded, and primed. The fireplace is done being framed out. The downstairs' bathroom is drywalled and the shower is tiled (not yet grouted). I removed the wallpaper and trim from the upstairs' bathroom. The outside patio, sidewalks, driveway, and windows have been pressure washed to remove all of the dark grey/green mold and mildew stains. And I managed to get J's dream tile (granite) down from $10.99/sft to $7.55/sft using my Italian bargaining skills. This saved about $535 in materials and tax! It's not me Sarah, it's my dad! I told him he should get an RV and travel the country taking requests! So many ppl are asking him now from Cali to NY! Way to go on the bargaining! Love the beef, I'll have to try that! Nice on the house! Ohhh crock pot cooking is where we are at w/o a range. This is on the list for Sunday our meat day, whew! Nice work on the house guys! Hi Christina, love the progress pictures! Have a good weekend. I am totally going to make that dish - 2 ingredients? Perfect!! So glad its warm today - I've got my doors/windows open and did about 2 hours of spring cleaning! I've never heard of this recipe so feel like I've been under a rock. I did hear someone on Top Chef mention pepperoni beef, though. I think. Totally confused. Anyway, love it when people show remodels. Thinking of ripping out a bathroom and am WAY nervous over it.